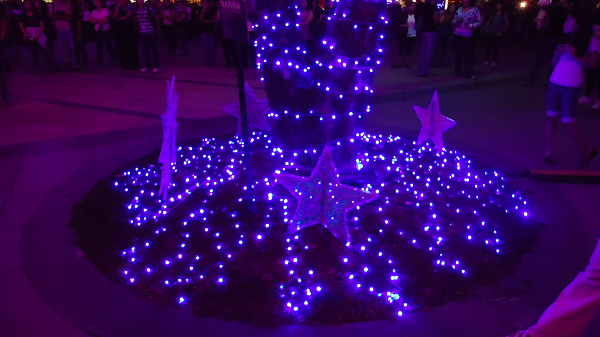 It's a must see Christmas spectacle for the whole family this holiday season. 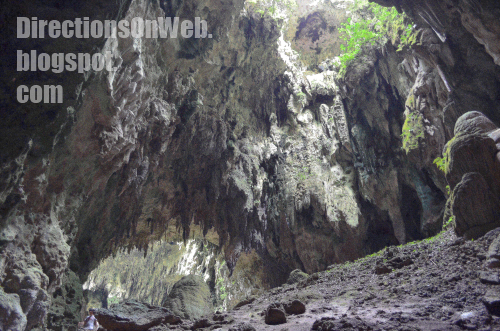 It's also a great attraction for foreign tourists. An awesome music, light and sound show with Christmas theme that happens every 30 minutes from 6 pm to 8 pm daily including weekend, surely this event is a treat for everyone. Go get your cameras and video recorders and head to the Ayala Triangle Gardens to experience world class presentation of the Ayala Land. Enjoy all the photos here, then go get there with your friends and family and experience it for yourself. 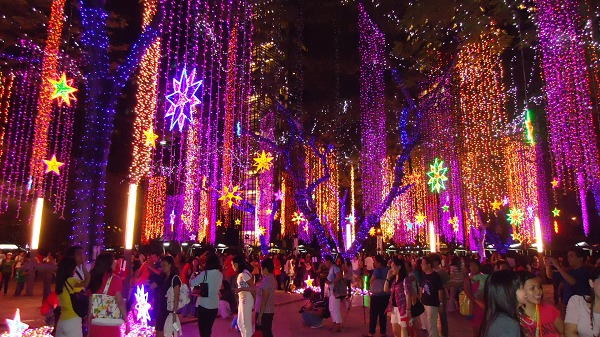 The Symphony of Parols will last until December 23, 2010. It started on November 17, 2010. From Alabang, Sucat, Bicutan, Taguig and neighboring vicinity as well as provinces from Southern Luzon. Take the Skyway all the way to Makati. Exit to Don Bosco. Turn right onto Don Bosco Street and left on Chino Roces Avenue formerly Pasong Tamo. Turn right onto Arnaiz Avenue. You must turn left on Makati Avenue, passing Paseo de Roxas. Stay to the left of Makati Avenue. Turn left on Ayala Avenue. 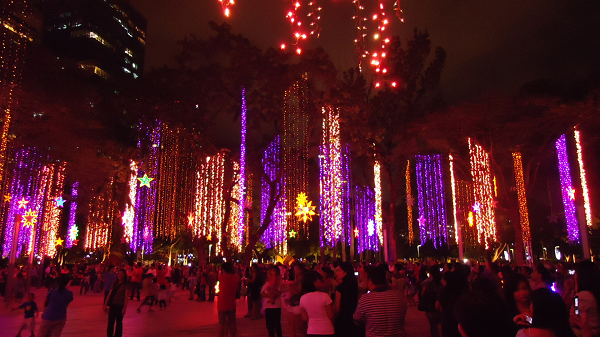 Ayala Triangle is located in Philippine Stock Exchange Building. It's best to drop off your family infront of Ayala Tower One Building before you park your car to the nearest parking, because the Symphony of Parols is just right behind the building. You can ask Security Personnel where to park your car. It is advisable to go Saturday or Sunday to avoid heavy traffic in the vicinity. From Mandaluyong, Pasig, Cubao and Guadalupe taking Edsa. Turn right onto Gil Puyat Avenue formerly Buendia. Stay to the left and turn left on Paseo de Roxas. Stay to the left of Paseo de Roxas and turn left on Makati Avenue. Stay to the right and finally, turn right onto Ayala Avenue. 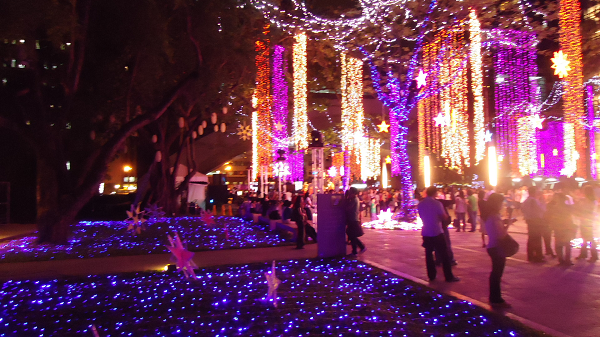 While you are along Makati Avenue, you can already see the Ayala Triangle Garden to your right. It's best to drop off your family infront of Ayala Tower One Building because the Symphony of Parols is just right behind the building. You can go park your car afterward. Just ask Security Personnel where to park your car. It is advisable to go Saturday or Sunday to avoid heavy traffic in the vicinity. From Pasig, Marikina, Antipolo, Rosario, Eastwood and nearby areas. Take C-5 all the way to Fort Bonifacio. You must stay to the right after you passed Kalayaan Avenue. Turn right onto 32nd Street. Stay to the middle of 32nd Street, pass 5th Avenue and take the Kalayaan flyover. Stay on Kalayaan flyover up to Gil Puyat Avenue formerly Buendia. Along Buendia stay to the left and turn left on Paseo de Roxas. Stay to the left of Paseo de Roxas and turn left on Makati Avenue. Stay to the right and finally, turn right onto Ayala Avenue. While you are along Makati Avenue, you can already see the Ayala Triangle Garden to your right. It's best to drop off your family infront of Ayala Tower One Building because the Symphony of Parols is just right behind the building. You can go park your car afterward. Just ask Security Personnel where to park your car. It is advisable to go Saturday or Sunday to avoid heavy traffic in the vicinity. From Mandaluyong, San Juan, Boni take San Francisco Street or Primo Cruz and head toward Coronado Street. Take the Mandaluyong-Makati bridge and head to Makati Avenue. Stay to the middle of Makati Avenue, cross J.P. Rizal, Kalayaan, Gil Puyat Avenue formerly Buendia and Paseo de Roxas Avenue. Now stay to the right of Makati Avenue and finally, turn right onto Ayala Avenue. 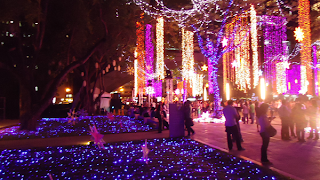 While you are along Makati Avenue, you can already see the Ayala Triangle Garden to your right. It's best to drop off your family infront of Ayala Tower One Building because the Symphony of Parols is just right behind the building. You can go park your car afterward. Just ask Security Personnel where to park your car. It is advisable to go Saturday or Sunday to avoid heavy traffic in the vicinity. From Libertad in Pasay, Baclaran as well as Cavite who preferred this route. Take Libertad Street now named Arnaiz Avenue. Turn right onto Osmena Highway also known as South Super Highway. Stay to the right to avoid going up the flyover. Also avoid the ramp to the Skyway. Make a U-Turn on the U-Turn slot under the Magallanes Flyover Interchange, right before EDSA. Drive slowly to make sure you wont lead to the Skyway and the flyover of SLEX as there's no turning back. Once you made the U-Turn, stay to the right of Osmena Highway. Turn right onto Don Bosco Street then left on Chino Roces Avenue and again turn right onto Arnaiz Avenue. You must turn left on Makati Avenue, passing Paseo de Roxas. Stay to the left of Makati Avenue. Turn left on Ayala Avenue. 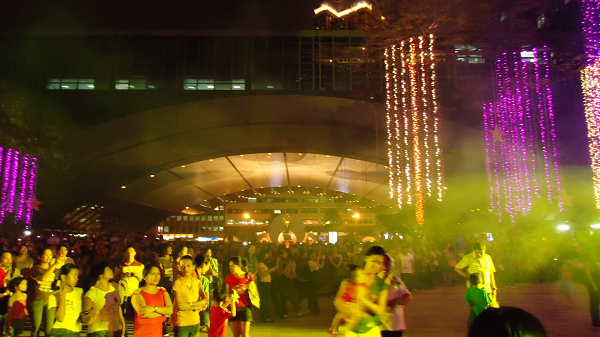 Ayala Triangle is located in Philippine Stock Exchange Building. It's best to drop off your family infront of Ayala Tower One Building before you park your car to the nearest parking, because the Symphony of Parols is just right behind the building. You can ask Security Personnel where to park your car. It is advisable to go Saturday or Sunday to avoid heavy traffic in the vicinity. From Manila take Quirino Ave, turn right onto Osmena Highway then turn right onto Vito Cruz now named P. Ocampo, turn left on G. del Pilar, left on Zobel Roxas, cross Osmena Highway then right onto Kamagong Street. Stay to the middle, cross Chino Roces Avenue. After Bagtikan Street the road bends toward Ayala Avenue, stay to the middle and cross Gil Puyat. Stay to the middle, cross Rufino Street formerly Herrera. Stay to the left then turn left on Paseo de Roxas, you are now seeing Ayala Triangle Garden to your right after the Ayala Tower One Bldg. Stay to the right and turn right to Makati Avenue. Now stay to the right of Makati Avenue and finally, turn right onto Ayala Avenue. It's best to drop off your family infront of Ayala Tower One Building because the Symphony of Parols is just right behind the building. You can go park your car afterward. Just ask Security Personnel where to park your car. It is advisable to go Saturday or Sunday to avoid heavy traffic in the vicinity. From Monumento taking EDSA, as well as other areas along the way. Stay on EDSA all the way to Makati. Turn right onto Gil Puyat Avenue formerly Buendia. Stay to the left and turn left on Paseo de Roxas. Stay to the left of Paseo de Roxas and turn left on Makati Avenue. Stay to the right and finally, turn right onto Ayala Avenue. 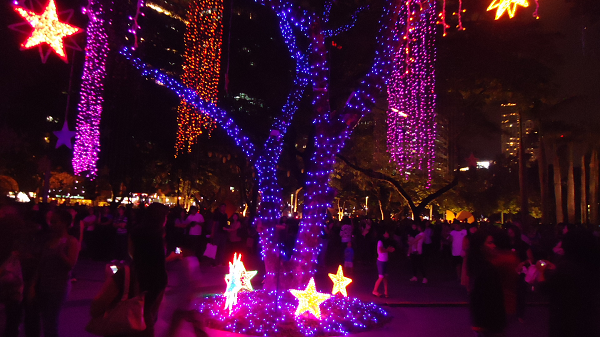 While you are along Makati Avenue, you can already see the Ayala Triangle Garden to your right. It's best to drop off your family infront of Ayala Tower One Building because the Symphony of Parols is just right behind the building. You can go park your car afterward. Just ask Security Personnel where to park your car. It is advisable to go Saturday or Sunday to avoid heavy traffic in the vicinity. If you have any questions regarding directions to Symphony of Parols click here. Take bus anywhere along EDSA with "Ayala-LRT Leveriza" sign. In Monumento, you can take ride bus at the corner of 5th Avenue also known as C-3. You can also ride a bus bound to Ayala from Fairview and Novaliches. You can get off exactly at Philippine Stock Exchange and walk you way up to the Ayala Triangle Garden. From Baclaran, ride bus with "Ayala LRT Leveriza" sign. During weekdays, get off at proper unloading area which is right before Paseo de Roxas. Otherwise, you will walk way too far because the next unloading station for north bound lane of Ayala is on Rustan or Glorietta. Once you got off the bus in the unloading area before Paseo de Roxas Street, walk your way to the underpass and head onto the opposite side of Ayala where the Ayala Tower One is standing. At the back of the building is the Symphony of Parols location. 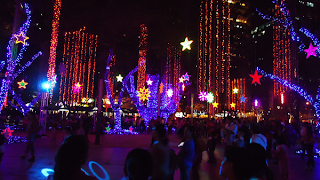 During Saturdays and Sundays, you can get off at the opposite side of Ayala Tower One Bldg and cross the road to get to the Ayala Triangle Garden where the Symphony of Parols is located. This route can also be taken by those coming from LRT-1 Taft Avenue, Harrison and Leveriza. From the corner of Ayala and McKinley, ride jeepney at the terminal located at the service road of Mc Kinley Street opposite Shell Gasoline Station. Get off after Paseo de Roxas and use the the underpass to get to the Ayala Triangle Garden. No unloading in Ayala Triangle Garden during weekdays, but during Saturdays and Sundays, loading and unloading city ordinance of Makati is not being implemented or enforced. LRT-1 from Roosevelt including all stations in between Gil Puyat and Roosevelt, get off at Gil Puyat Station. Take a bus with "Ayala" sign and get off at right unloading zone. During weekdays, get off at proper unloading area which is right before Paseo de Roxas. Otherwise, you will walk way too far because the next unloading station for north bound lane of Ayala is on Rustan or Glorietta. Once you got off the bus in the unloading area before Paseo de Roxas Street, walk your way to the underpass and head onto the opposite side of Ayala where the Ayala Tower One is standing. At the back of the building is the Symphony of Parols location. 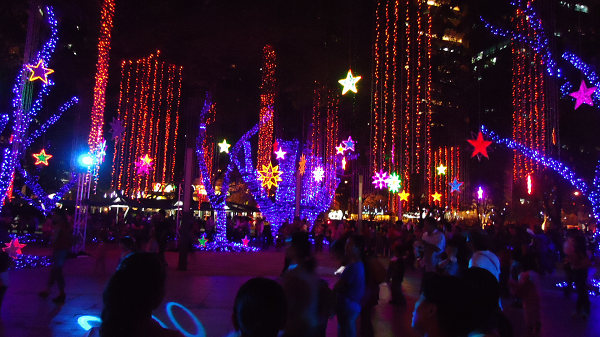 During Saturdays and Sundays, you can get off at the opposite side of Ayala Tower One Bldg and cross the road to get to the Ayala Triangle Garden where the Symphony of Parols is located. MRT-3 commuters who are riding trains coming from both Taft and North Avenue Stations, get off at Ayala Station and ride jeepney at the terminal located at the service road of Mc Kinley Street opposite Shell Gasoline Station. 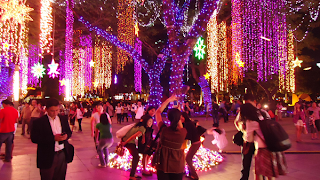 Get off after Paseo de Roxas and use the the underpass to get to the Ayala Triangle Garden. No unloading in Ayala Triangle Garden during weekdays, but during Saturdays and Sundays, loading and unloading city ordinance of Makati is not being implemented or enforced.